I grinned when I got this Random Event, then realized just how horrific it was. JUST a leg? What on earth happened to the rest of the poor Petpetpet??? Inspired by the idea of RE's being ever-so-slightly horrific, I thought I'd write this article! Most people think of this website as being fun, positive and full of humor. Yet it also has its darker aspects as well! Here is a hilarious list of all the RE's that are subtly horrific, that you may not have realized were scary! I hope you enjoy reading it! 1. Ohhh, how cute. It seems one of your Petpets has got a Petpetpet in it's mouth. Wait a minute, that's just a leg! As I stated earlier…what happened to the rest of the poor Petpetpet? 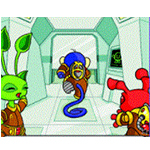 This will forever be a mystery to us Neopets players. Somewhere out there, there's a sad little Petpetpet limping around with a missing leg or two. How sad! 2. The Emperor of Shenkuu is throwing a festival for his daughters. You pay 16.67% of your Neopoints to help fund the event. How nice! You get to contribute to the Emperor's festival! 16.67% isn't a huge amount of np, and it'll be nice to attend the party and see everyone dressed to the nines…wait, what? You're not even invited? What the heck! 3. A passing zombie runs into you and doesn't even seem to notice. Once she's gone you realise she dropped a piece of a long lost treasure map! It's nice to collect a free piece of a treasure map, but why in particular was it dropped by a zombie? Are there multiple zombies zeroing on the same location? Is this map something that you really want to follow? There might be treasure, but is it worth being surrounded by a hundred hungry zombies who would think nothing of eating your brains? 4. The Ghost Lupe appears suddenly and growls before disappearing again. You realise all your Neopets are now at full health! How nice, the Ghost Lupe healed all of your pets! But wait, why? Is it in anticipation of some future battle? How full of consternation we should all be whenever we get this strange RE! 5. Watch out!! A Fire Faerie shoves you out of the way as a cloud from old Faerieland crashes to the ground. Why on earth would someone be scared of a cloud? This RE always leaves us scratching our heads in bewilderment. Wouldn't getting hit by a cloud be something soft and fluffy? Maybe even strange and magical? What exactly is there to fear that we don't know about? 6. A Gnorbu wanders past you. Suddenly, your feet feel cold. How odd. This RE seems benign enough, until you realize that the Gnorbu has just sucked the body heat out of your extremities. That's quite sinister and alarming! What would happen if multiple Gnorbus wandered past? Would you lose all body heat entirely, and pass out from the cold? This RE causes your pet to lose 1-4 intelligence points, and is really unfair! People are divided over whether Jelly World exists or not, and believing in it shouldn't make our pets lose intelligence points. Why not leave the believers and nonbelievers alone with their personal beliefs? 8. The Ghost Lupe growls, "My what tasty Neopets you have!" I can understand this RE if your pets all happen to be Chias, since Lupes are known for their ravenous appetite for Chia flesh. However, what does it mean when all of your pets are Lupes? Would this constitute a type of cannibalism? How macabre! 9. The ghost of Coltzan appears to tell you the secret of receiving a million Neopoints from his shrine. Unfortunately, he seems to have Kikoughela today. Who knew that ghosts could get sick? I've always been confused by this RE, since I always thought that spirits were immune from earthly illnesses. For now, I'll just keep scratching my head in confusion, and hope that the ghost of Coltzan feels better soon. 10. The Ghost Lupe growls "Begone! Leave this place!" Why is this RE encouraging us to leave the site? It just doesn't make sense! Does it want us to…*shudder*…go outside? 11. The Kiko Lake team is collecting donations so they can go to the Altador Cup this year. You donate ITEM NAME. How nice! Donating items is nice, but since this is an RE, our items are FORCIBLY wrenched from our unwilling hands. Goodness knows if this RE will grab a cheap item or an expensive one! Let's just hope that whenever you get this RE, it'll nab the cheap item instead! 12. A blue Kacheek in overalls walks up to you and boy does he smell. *Whew* He says, "Hey you might find some exciting stuff in my Rubbish Dump located in Meri Acres!" This is not the most compelling or attractive RE, and I'm always a little horrified by it. I never follow the link to the Rubbish Dump…I just wince a little and refresh the page so that the RE goes away. I don't think anyone has ever found something of interest at the Rubbish Dump, so I don't think I'm missing out on anything good! So these were all of the RE's that make me do a double-take! They seem normal at first, until you think deeper into them and realize just how horrific they are. Kudos to TNT for coming up with such fascinating and wicked RE's! They're just one more reason why I love this site so much! Do you suppose TNT will ever come up with new RE's? I sure hope so! I hope they're as odd and twisted as the RE's that already exist on the site, and I look forward to them with glee! Thanks for reading this absolutely peculiar article, my fellow players! Stay tuned for future articles from yours truly, and have an amazing week!